Unlike the other camping experiences on this site, horseback camping is very special. This is because the transport is not some inanimate machine but a living, breathing, thinking animal. For those of you who have been fortunate enough to have a horse, you will appreciate the relationship and bond one can develop with a horse. My father grew up in Perth Western Australia and began catching wild horses around Perth in the 1940s and in later years, became a stock-man on sheep and cattle properties. As a result I was introduced to horses and riding at an early age. My earliest recollection of riding is from a circus that came to Bullfinch when I was about six years old, and I volunteered from the crowd to ride bare back ( no saddle) a circus horse. The ringmaster wasn’t going to make it that easy though and I was to ride a lap around the ring, standing on the horse. For my effort I received 2 pounds (yes it was before the currency pound to dollar conversion in Australia). We had a number of working horses on our property, and as a child it was my job to catch them each morning for the stockmen. This involved getting up around 3.30 am in the morning and tracking the horses to where they were grazing since their release the night before. Cobber was an old trotter that my father had saved from the knackery, and he wore a bell around his neck, which on clear, still mornings was supposed to help in locating their whereabouts. Cobber was often not a lot of help though. He would stand dead still so the bell wouldn’t tinkle, and I would have to follow tracks and gauge the freshness of manure droppings in order to find them. The horse paddock was over a mile square and depending on where they were this exercise could take an hour or so. Once located I would catch the quietest horse, and muster the remainder, driving them back to the stockyards where the stockmen were waiting impatiently to saddle up for the day’s work.My father bought my first horse, Blondie (pictured above) when I was nine years old. A young skewbald mare that had a nasty streak and we really didn’t get on. 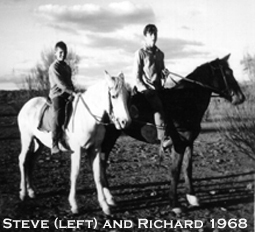 She was a quiet as pie with my father, but from the outset she would bite me when I mounted (I always had large blue-black bite marks) and would take any opportunity to gallop under low hanging branches trying to dislodge me. Her other favourite trick was to wait until I was seated and relaxed, then she would start bucking trying to unseat me. Anyway it was all good experience and preparation for horseback camping. In my teens I bought a gelding called Chiarascurio who was a fantastic stock horse and a great friend. Barrel-chested, with a deep strong neck he was the ideal stock horse, and could shoulder a breakaway steer at full gallop. One day he was startled in a yard and backed through a rail fence which snapped under his weight. Crashing through the rail he fell on his haunches, and as he stood up he made contact with the top rail which broke his back. I nursed him for 24 hours waiting for my father’s return, but there was nothing that could be done, and with great sadness I had to shoot him. The first major horseback camping trip took place when I was about nine or ten years old. Richard Cotterill and I saddled up, and with a pack horse in tow we rode to Minnie Creek and back, which ended up a six day ride. Unfortunately, a dingo had died in the waterhole at Minnie Creek, floating and disintegrating into a putrid mess. We spent the day boiling water for the horses, and mixing soup cubes so we could drink the foul tasting fluid. Of course camping was a way of life even at that early age, and something we did frequently, but we spent weeks planning for our horseback camping trip. The key to any extended camping trip is thorough planning, and thinking through contingencies for a range of possibilities. Each night we hobbled and put bells on the horses. 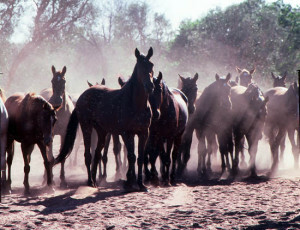 If you are miles from anywhere the last thing you want is your horses to disappear, and hobbling allows them to graze but not get too far away. If you are backpackingg you don’t overload you pack. The same principle exists when horseback camping, don’t overload your friends by taking superfluous equipment. 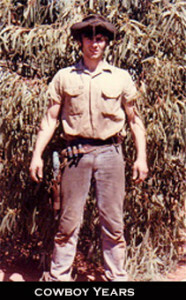 I lived in an arid environment on the edge of the Great Victoria Desert, and one of the reasons we took a pack-horse was to carry some fodder for the animals and a limited amount of water. These days you need to be careful carrying fodder for horses, particularly if you plan to ride in National Parks. Studies have shown horses can retain weed seeds in their gut for up to 14 days and these can then germinate in manure. On the horses we rode, we had two saddle bags, a quartpot and bedroll across the back. This simple configuration can provide you with enough food for weeks. Horseback camping today is very different to that of years gone by, and we have a different set of expectations and responsibilities. It is sensible to carry a first aid kit for horse and rider. Key members of a party should be trained in first aid and have basic veterinary first aid skills. The use of riding helmets is encouraged, particularly for children. Helmets are generally available as part of any commercial horse riding tour. It is also important to check all saddlery equipment prior to commencing a horseback camping trip to ensure there are no faults and that appropriate safety gear is present; eg surcingles on stock saddles, breast plates and cruppers for rugged country. Remember to take spare ropes horse shoes and shoeing gear. Let someone know before you go by telling a friend your route and expected time of return. If an emergency develops, one of preferably two riders should go for help whilst the others stay with the injured or ill person. Keep the patient warm and monitor their condition. Horseback camping is a wonderful experience. 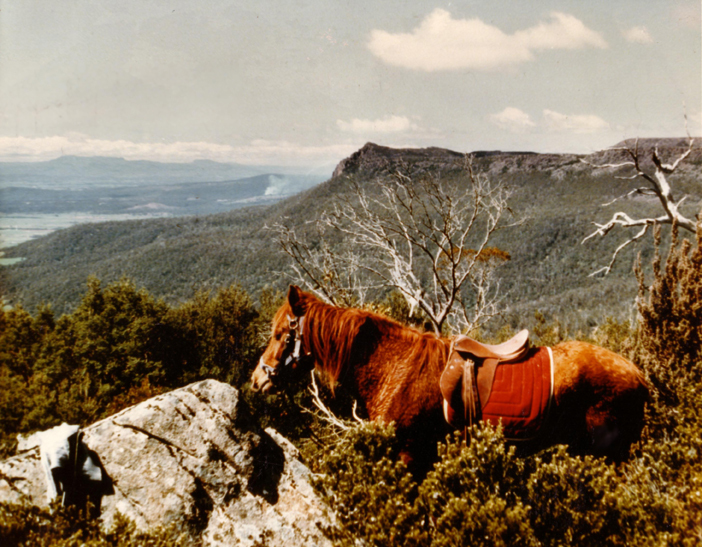 Below is a picture taken along the Western Tiers, where I rode and camped for over two weeks in the Tasmanian Highlands.